The day before, prepare the cranberries. Mix 1/2 cup water with 1/2 cup granulated sugar, boil for a couple of minutes until sugar is fully dissolved. Reserve at room temperature, let it cool for 5 to 10 minutes. Add the syrup to a bowl and dumb the fresh cranberries into it, mix to coat the surface with the syrup. Place in the fridge overnight. Next day, drain the syrup, and add to the cranberries 1/2 cup granulated sugar. Coat them well, then place over kitchen paper to dry for 2 hours. They will be ready to decorate the dessert then. Make the mousse. Melt the chocolate with the milk in the microwave or in a double boiler over gently simmering water. Add the corn syrup and mix well. Let it cool slightly while you prepare the cream. Whip the heavy cream until it reaches the consistency of melted ice cream. Add to the chocolate base in three portions, mixing well but gently, you don’t want to deflate the mousse. Add small portions to very small ramekins and cool for 6 hours in the fridge. Top with the sugared cranberry, and sprinkles of your choice. Serve straight from the fridge. Comments: These adorable baby-mousses deliver the perfect amount of sweetness when a slice of pie, cake, or even a piece of brownie might seem like overkill. Of course, you could make a regular portion if you prefer. 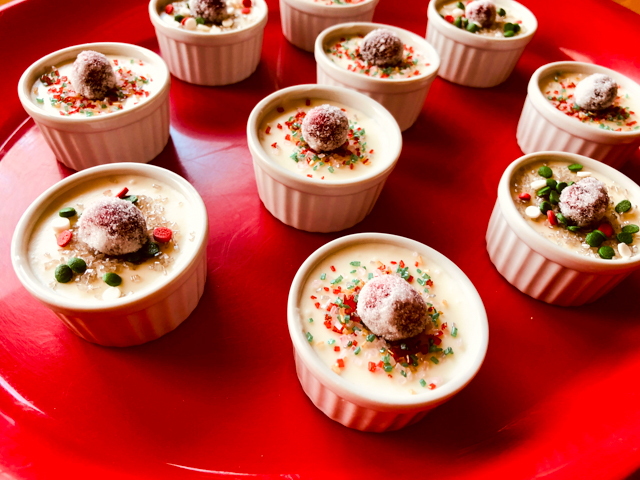 Instead of 10 individual tiny amounts, make 4 portions for indulging with abandon. What I love about this recipe, apart from its simplicity, is that it uses exactly one bar of Lindt white chocolate. Open it, dice it, you are done. No need to get your scale or anything. Now, if you want to serve bigger portions, it might be a good idea to add a bit of gelatin. White chocolate does not hold as well as dark. 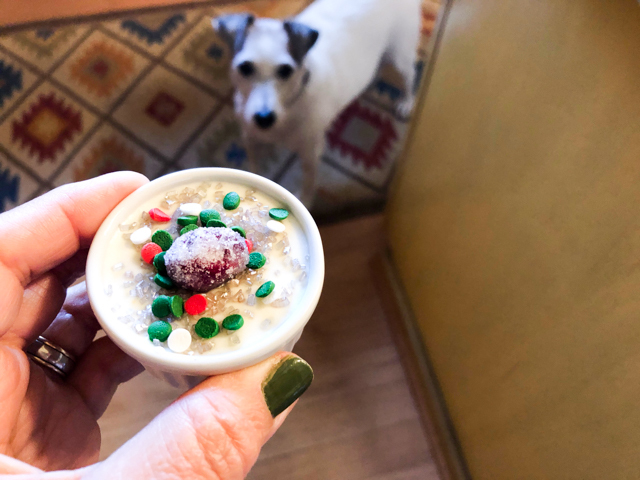 In a very small ramekin it wont’ be a problem, but when scaling up, it’s probably better to ensure some additional structure by incorporating gelatin. I suggest 1/2 tsp for the 4 oz of chocolate, blooming it in some of the milk, then heating it very very gently before adding to the melted chocolate. Proceed with the recipe as described. TWO YEARS AGO: Happy Thanksgiving! If you are tired of pumpkin pie for Thanksgiving, may I offer the perfect alternative? 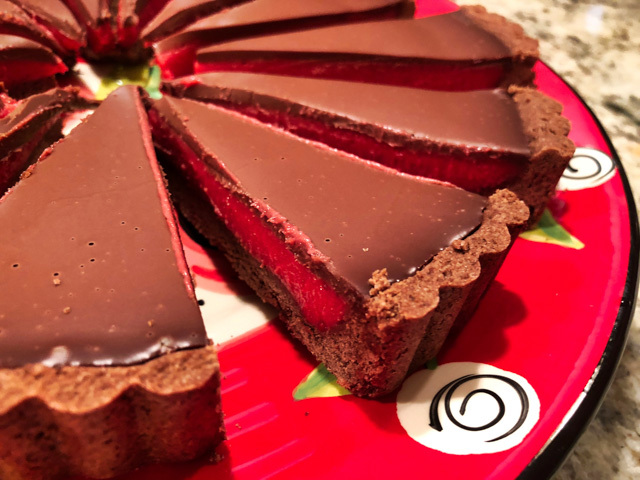 The color of the cranberry curd as you cut through the pie is enough to make your heart miss a beat. Plus, if you prefer a dessert that is not cloying sweet, look no further. Tartness in the center, subtle chocolate sweetness on top and bottom. Oddly enough, I’ve had this recipe in my files to try soon ever since Helen published it in her blog. We are talking November 2014. I know, what’s wrong with me? (Please, refrain from answering, it is a purely rhetorical question). Heat oven to 350 degrees. Spray the bottom of an 11”x1” quiche pan with removable sides in the center only. Set aside. Combine flours and cocoa in bowl of mixer. Mix briefly to combine. Add butter and cut in until very fine. Add sugar and baking powder. Mix to combine. Add egg and egg yolk; mix until it balls up and rides the blade. Remove from the processor and divide in half. Divide one half into 2 pieces. Roll one piece into a rope and press it in evenly along one side of the pan. Repeat with the second half of dough. Overlap the seams and seal well so no seam shows. Press the remainder of the dough into the bottom of the pan. Seal the edges very well so no line shows. Prick the shell before baking. Bake approximately 10 to 12 minutes or until completely baked. Cool completely. 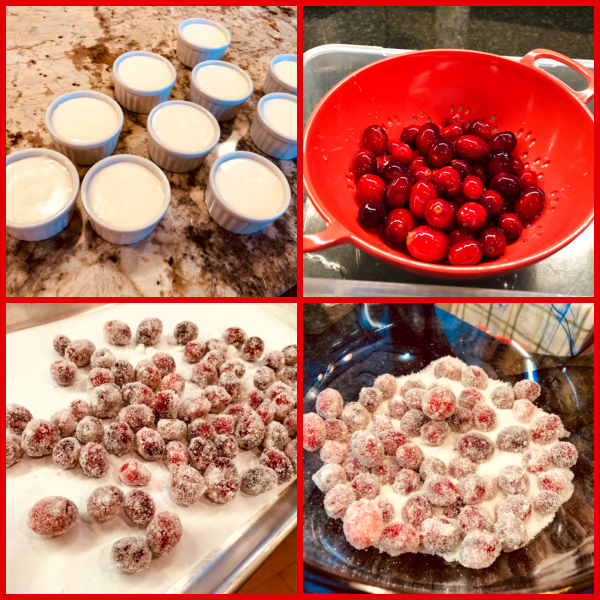 Place the cranberries in a rimmed baking sheet and pick over. Shake the tray to move the berries around. Place the cranberries in a saucepan with sugar and water over low heat until the cranberries are very soft and some of them have popped. Stir frequently as this will be very thick and can scorch. Immediately, puree them in a food processor (by batches if necessary). Puree for several minutes to get the skins as fine as possible. There will be tiny specs of red which is as it should be. If you prefer to remove the skins, strain the puree before proceeding. Add the yolks and lemon juice to the processor and process briefly. Place the cranberry mixture in the top of a double boiler and add the butter. Bring the water underneath to a boil. Stir the curd constantly until an instant read thermometer reads 170 degrees. Immediately pour into the cooled crust. Smooth the top. Cover directly with film and refrigerate for several hours or preferably overnight. Bring the cream to a simmer. Submerge the chocolate. Allow to sit for 4 to 5 minutes then whisk gently to smooth the chocolate completely. Remove the film from on top of the cranberry curd. Pour the glaze in the center and move it out to the edge of the curd with an offset spatula. Refrigerate if using within a day or two. Freeze for up to a month for longer storage. Comments: First of all, I urge you to visit Helen’s site because as is always the case for her blog posts, you will find a step by step tutorial that will guide you through the process. Even if you’ve never baked a tart in your life, her explanations will take you to a happy – and tasty – ending. This was my first time making this type of press-in crust. I normally delegate all things crust (pies and tarts) to Phil, but not this time. My pan was a little smaller than the one she used, so the crust turned out a bit thick at the bottom. With my inexperience, I was a bit insecure to use less crust, not knowing exactly what to expect. Next time I’ll make sure it’s thinner. Anyway, if you have the right size pan, just follow the recipe exactly. The color of the cranberry curd is something! 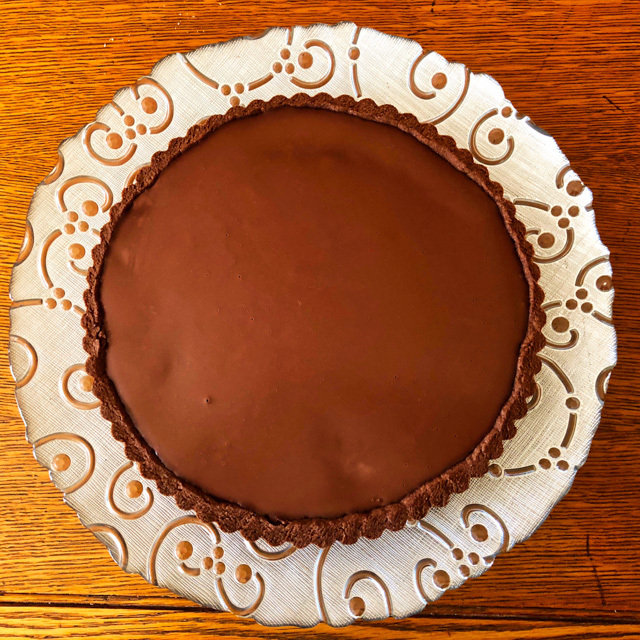 I shared a few photos on my Facebook page, and some of my friends were wondering how to get the finalized tart to show the curd, maybe reducing the glaze to a zig-zag drizzle, or putting the glaze underneath the curd instead. Having tasted it, I think the tartness of the curd really benefits from a nice layer of ganache on top. So the striking beauty of it will have to be appreciated only after slicing. Gastronomic compromise. This is a perfect recipe for those who don’t like overly sweet desserts. The colors scream end of the year festivities, so I hope you consider making it if not for Thanksgiving, before 2017 says goodbye. 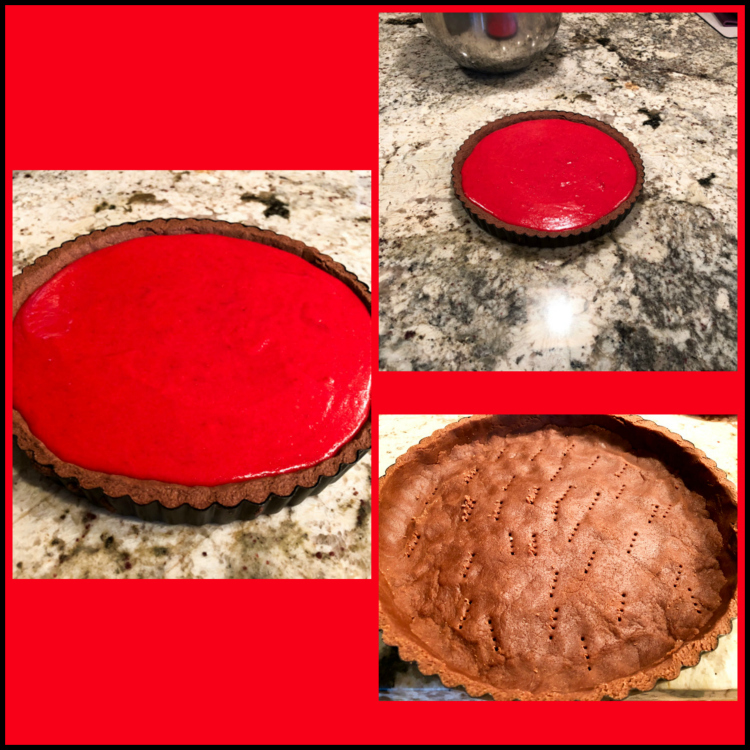 I am a bit ashamed it took me so long to get to this tart, but better late than never!